It is a truth universally acknowleged by at least four people that I have no love for Damien Hirst, Artist; (Damien Hirst, Chap, is quite a different matter: he makes me chuckle, and you can’t put a price on that.) Some of those four (two) who actually give a toss about my views on anything at all have equated this animosity with an antipathy towards Conceptual Art in general: this is not the case. Anyway, back to Conceptual Art. My problem with Mr Hirst is this: for me, there is no humanity. The artefact – I hesitate to call it ‘art’ – has no ‘heart’. I may have been shocked and disgusted on cue (once upon a time), but this is not the same thing at all. I have never, not once, been moved by anything he has created: it seems the more I put into his stuff, the less I get out of it. Call me old-fashioned (please), but intellect without emotion does not make for good art and never has, be it in music, literature, performance, whatever. Hirst’s work seems to me glib, disingenuous, cynical, the very antithesis of what it is to be humane. But then, Hallelujah! 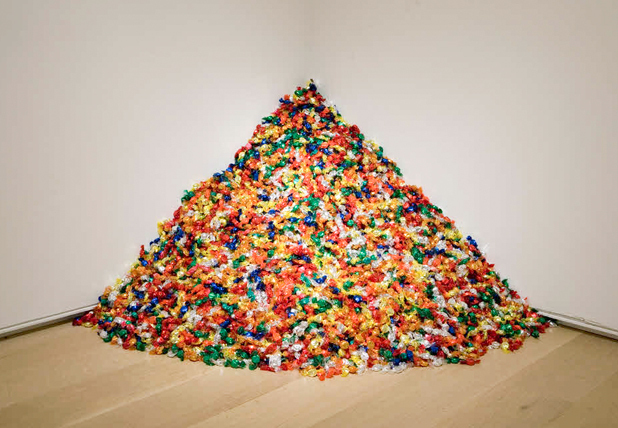 – I discovered the work of Felix Gonzalez-Torres; Conceptual Art became, for me, a whole new ball-game, one that repaid my attention. What do you think when you see a pile of colourful, shiny cellophane-wrapped sweets? I think, Ta very much, I’ll take two! I think of the big tins of ‘Roses’ we have at Christmas; of giving and sharing. And we are meant to share, to take the sweets and deplete the pile, and every day that the artwork is on show it is restored to its original weight of exactly 175lbs, which, as the accompanying wall-text (text, titles, are the sine qua non of Conceptual Art) tells us, was deemed by his doctor to be Ross’ ideal weight. Safe to assume, I think, that Ross was a fun, social guy, freely giving of his time and spirit. But that note on the wall undercuts all this gaiety with something very serious, even frightening: ‘sharing’ also references Ross’ AID-related death; contagion, infection; ‘share’ too freely and you will be sick. The daily depletion of Ross the work can be read as the daily depletion of Ross the lover of Felix through the ravages of terrible illness. 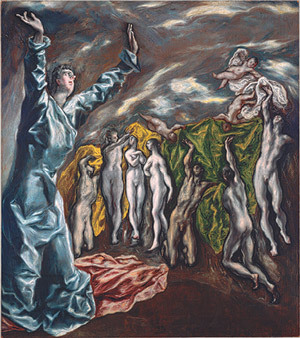 The celebration of someone deeply loved and missed is inextricably tied to the manner of his going, and it is this concept that, while the form of the work is fluid, becomes fixed through constant, daily re-iteration; a kind of Eucharist perhaps, a Holy Communion, where love and loss, participation and memory, combine and become something almost sacred. This is so far above and beyond anything Hirst has ever done or even attempted to do. I cannot help but be intensely moved by Ross; yes, it’s ‘easy’, but it’s not glib; it’s considered, elegiac, moral, even; it breathes humanity. 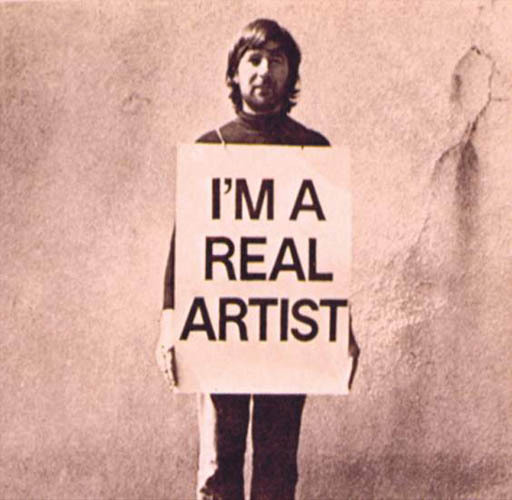 I’m still inclined to agree, anti-‘conceptually’, with Hockney: art should be about Poetry and Craft; but sometimes, just sometimes, in the hands of a real artist, the poetry is enough. This entry was posted in art and tagged art, conceptual art by Glennie Bee. Bookmark the permalink. – Nail firmly on the head! Agree that there’s no humanity in the cheeky chap’s work, but there’s also very little actual concept. The work is ‘teenage’, it’s attention-seeking, even the spots. He said on telly today that a work succeeds if it provokes thought an hour and even a day after viewing…well Damien: big fat FAIL! Shock value lies in the instant, not in reflection on the instant…duh! The best of conceptual art repays attention (well said), it may ask for an intellectual engagement but often delivers an emotional payback, which isn’t so different to reading a novel or poem. The worst of conceptualism is either one-dimensional (Hirst) or lost up its own pseudo intellectual arse, treating the language itself as the point which, in our post post-modern times, should never be enough! Great post again, love the bit on Gonzalez-Torres! Thank you so much, Tony. Very thoughtful, great point about D’s ‘concept’, and totally agree with the Warhol comparison: the Marilyn Diptych packs an emotional punch for me that can, if I let it, reduce me to tears. I heard on R4 yesterday (I still have to watch the telly thing – Corrie took precedence) that DH is now changing tack and going in a ‘new’ direction; one can only hope it’s towards Art. I’ve never spent too much time thinking about Hirst’s work, but I think that’s because there’s nothing really to think about. It strikes me as being pretty nihilistic and soulless – and as you say, cynical. I enjoyed your reflections on Felix Gonzalez-Torres’ work though. I haven’t seen his work before. Quite touching. Yeah, he kinda ‘saved’ conceptual art for me. Thanks for your comment, Ryan. Oh hell, me too, Frank.